Guy Laliberté – Performer, Billionaire, Poker Player, Astronaut! 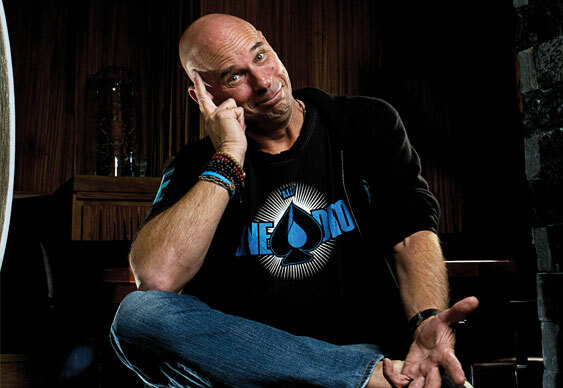 Cirque du Soleil founder and first poker player in space Guy Laliberté isn’t afraid to put his money in the biggest pots. At this year’s World Series of Poker, he’s convinced several dozen people to do the same – for a $1,000,000 buy-in charity tournament. We caught up with Guy to talk philanthropy, performing, going into space and of course poker. Tell us about the ONE DROP foundation. How did it come about? In 2007 I was thinking about how I wanted to celebrate 25 years of Cirque du Soleil. There were two options: either celebrate our successes or celebrate the future by nurturing the dream of a better world. I founded ONE DROP, a foundation dedicated to fighting poverty by giving access to clean water, because the situation was already more than urgent back then. Everything flows from water: it makes living, eating and developing possible. Not having water means living in misery, in degrading, unhealthy conditions, suffering from disease, going hungry… Water is also very inspirational for me and is the source of life. For more than 15 years, we had developed social arts programs at Cirque du Soleil using circus arts to improve the self-esteem of deprived young people, with the Cirque du Monde programme. ONE DROP used this very unique and proven approach to educate on water issues. I believe in the “soft medicine approach” – if you aim at touching people’s hearts, the message will have a greater chance of getting through. What are the organisation's goals? ONE DROP seeks to be an agent of change and influence in the world. Overall, in developed countries, ONE DROP implements educational and inspiring activities to raise awareness for as many people as possible on water-related issues. In developing countries, ONE DROP has ongoing projects – in Haiti, El Salvador, Honduras, Nicaragua, Burkina Faso and India – that our team leads to ensure their sustainability. How did the idea for the Big One for ONE DROP come about? I love playing poker and I believe that many poker players, pros or non-pros, are interested in giving back. I’m friends with Mitch Garber [CEO of Caesars Interactive Entertainment] and we discussed the possibility of putting together The Big One during a hockey game in our hometown of Montreal. ONE DROP and WSOP teamed up very quickly and imagined this historic poker event. How many runners do you expect? How much money do you hope to raise? If we reach the 48-player cap, which is our target, we will raise over $5m and save many lives by giving access to clean water. Briefly describe your rise from humble street performer to billionaire. From a very young age, I cherished the dream of travelling. The quickest way I thought I could achieve that dream was by playing music. I learnt to play my father’s accordion and started organising small events and school outings. I raised enough money to travel to Europe, one-way, for a voyage of discovery. There, I became a street performer, still playing music, but I also learnt how to be a fire-breather. When I came back home in the early eighties, I met up with a group of street performers on stilts. Together we started a street festival. We then thought of bringing the festival under a big top. Then, we decided we could tour with a show. In 1984, there was a major event in Quebec for the 450th anniversary of the discovery of Canada. Our show was perfect for the celebrations. Cirque du Soleil was born. Through a lot of hard work and hard years, we pulled through, a major break happening in 1987, with our very first entry to the USA at the LA Festival. It was a do or die situation! We made it. We became the flavour of the month and we pursued our creativity. Since 1984, we have created 32 unique productions and have been seen by 100 million spectators in over 350 cities on six continents. Life has been good to Cirque du Soleil and to me. For those who haven’t seen it, describe Cirque de Soleil, in your own words. Well, like I say, over 100 million people have seen a Cirque du Soleil performance and so there are probably 100 million different descriptions of their experiences. Basically, we try to offer escapist entertainment for a few hours, provoking an emotional bond through artistry, music, lighting and amazing human performance. Tell us about your space mission. You described it as a “poetic social mission”. What did you mean by that exactly? In 2009, when I was given the opportunity and the privilege, of being part of a Soyuz mission to ISS, I approached it in the same manner I approach all the most important projects in my life. I like to kill many birds with one stone. For me, personally, it was to be one of the most interesting challenges to take on. Since I knew there would be a lot of media attention, I knew it would be an exceptional opportunity to give ONE DROP the awareness and the publicity it deserved. Finally, all space explorers, private or professional, accomplish a mission on their journey. I’m not a scientist, I’m not an astronaut, I’m an artist. I imagined the Poetic Social Mission as the first ever artistic program broadcast from space and 14 different cities on Earth to touch people’s hearts about the situation of water by using an artistic platform. Again, I am a true believer of soft medicine and touching people at the heart to get a message through. ONE DROP was popularised on the world stage from that moment on. What does space travel feel like? I spent most of my five months of training in Star City asking the same question to the amazing astronauts and cosmonauts, and all answered in the same manner: it is something very personal to each individual. It is like nothing you have experienced and it is something you will never forget. How did you first get into poker and what was it about the game that you liked? I have always enjoyed gaming. I picked up on poker not that long ago, about seven years ago. Being in Vegas quite often, I would always have a go at the tables. A friend of mine brought me to a poker table. Immediately, I enjoyed the social aspect of the game – that very distinctive friendly competition. I also like the fact that you have to read the players, their way of playing, their strategies. It’s a game that fits my personality quite well. Now I have many friends in all types of circuits all over the world, and it is a great social distraction for me. Do you play a lot of poker these days? Let’s say that leading up to the BIG ONE for ONE DROP I have been in intense training! What’s the biggest pot you’ve ever won / lost? My losses were bigger when I used to play online only. I practically don’t play online anymore since my poker passion has evolved to a more social and community-based activity. I hope that my biggest pot will be coming up at the BIG ONE! Do you have any future plans for ONE DROP? I have big plans and dreams for ONE DROP. There is some urgency in regards to the situation of water on this planet. It is such an important issue and it needs our complete attention now. We need to unite to bring water as far as we can worldwide. I invite the poker community to visit ONEDROP.org often, where new initiatives are announced regularly.